How often have beleaguered householders, wading through this winter's floods, compared Britain with Venice. But it's a comparison that no longer holds water. 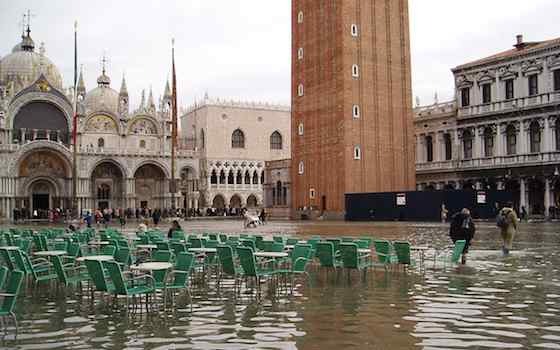 The annual inundations that covered St Mark's Square, forced tourists up on duckboards and threatened La Serenissima with watery oblivion will soon be a thing of the past. The vast barrage holding back the waters of the Adriatic is almost complete. Venice is no longer in peril. Maybe it's because we've grown so used to the bickering, the corruption and the hand-wringing over Italy's refusal to get on with the long-mooted barrage that we haven't noticed that the massive engineering works have not only begun but are almost finished. Across the water from Venice and beneath the Lido inlet to the lagoon, dozens of huge steel gates are ready to rise up from concrete troughs on the seabed. Work to seal off the other two inlets further along the Lagoon is almost finished. By 2016, the three barrages, comprising 78 gates, will be complete. How will it work? It's incredibly simple, and relies on buoyancy. Each of the large gates, 20 metres long, 4 metres thick and weighing around 350 tonnes, is hollow. Normally filled with water, each lies flat in a trough on the seabed, invisible to tourists admiring the views that inspired generations of artists. When there is warning of a storm surge, compressed air will be pumped into each gate, expelling the water and making one end flip up as the other is clamped to the trough with a 42-tonne hinge. Buoyancy is a powerful force. The gates will be able to hold back a surge of up to 3 metres. That should cope with any conceivable threat for the next thousand years. The worst flood Venice ever experienced was in 1966, when water levels rose 1.94 metres, damage estimated in the billions horrified the world and plans were first put forward for flood defences. There are no worries about Venice sinking any further -- since they stopped pumping out ground water on the mainland, subsidence has stopped. In fact, the city has only sunk 10cm in the past century, despite the fear of vanishing campaniles that prompted pizza eaters to add some small change to the Venice in Peril Fund. A certain amount of water will leak through the gaps of a few centimetres between each gate, but not enough to make much difference. A huge deep-water lock has been built beside the middle inlet, to allow cruise liners or fishing vessels to leave the lagoon and sail in when the sirens sound. It has all cost a colossal sum -- some €5.49 billion. And this is what all the argument has been about. Venice refused to cough up. Ecologists objected. Politicians prevaricated. Finally Rome stepped in, saying Venice was a national treasure, and work began in 2003. Since then it has all gone ahead at a cracking pace. The gates were built in nearby shipyards. Architects and engineers raised the canal embankments within the city, fixed the drains in St Mark's Square and landscaped the edges of the lagoon to create salt marshes that could better absorb tidal surges. The Arsenal was rescued from dereliction and turned into the control centre for Mose, an acronym for the barrage system that plays on the Italian for Moses. Something had to be done. Floods have become ever more frequent. In the 1920s, there were only two above 110cm; in the 1970s there were 31; and in 2001-10 there were 64. Tourists got used to paddling into St Mark's in wellies. It seemed fun. But it was destroying the city. In the past, Venetians happily piled more masonry on top of any building that collapsed. But conservators take a more nuanced view nowadays of those grandiose palazzi, echoing stone churches and towering campaniles that bring more than 30 million visitors to Venice each year. Now ancient Venice is proposing to export its technology to other cities threatened by the sea. It hopes the barrage will become a tourist attraction, as visitors peer at the brightly painted gates beneath the waters. Venice will remain dry underfoot -- something many Britons may envy in the future. "Venice: La Serenissima Turns the Tide"